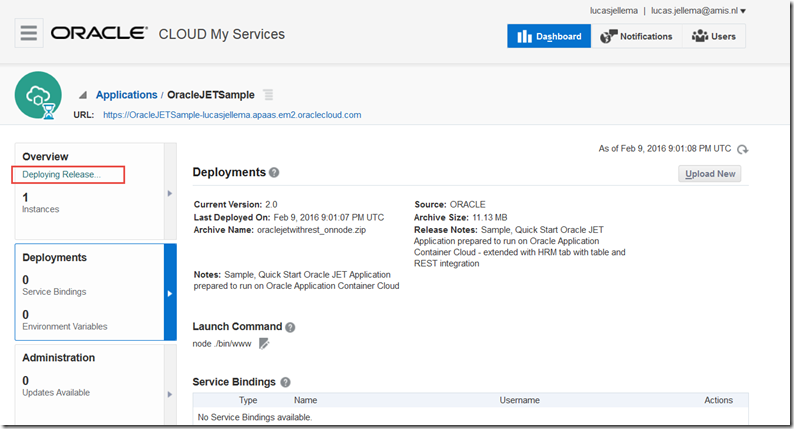 In this article, I will describe how I took the Oracle JET Sample application that I deployed to Node.js – locally and in the Oracle Application Container Cloud-and extended it with a new tab containing a table component that is data bound to a collection populated from a REST API that also runs on Application Container Cloud and accesses a DBaaS instance. 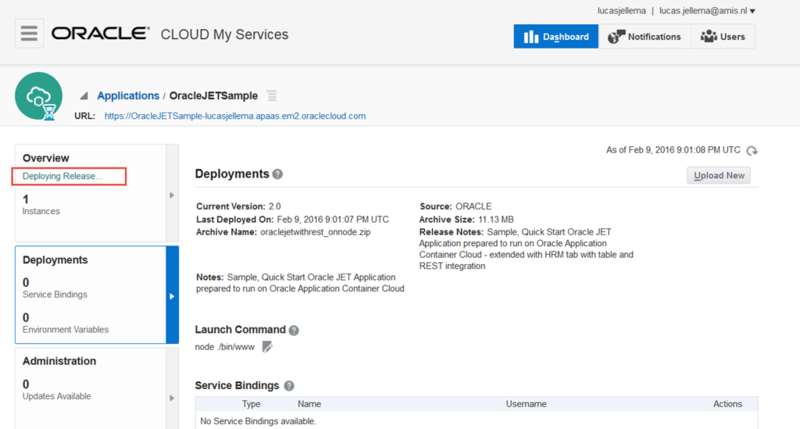 The initial application was described in this previous article (Deploying an Oracle JET application to Application Container Cloud and running on Node.js); in that article I took the Oracle JET Starter Template Quickstart sample application, configured it to run on Node.js (locally) and then configured it for deployment on Application Container Cloud and subsequently ran it on the cloud. 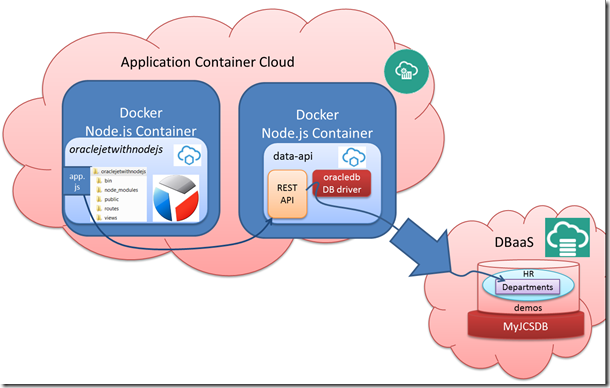 In this article, I will leverage the REST API exposed from a Node.js application Data API discussed in an earlier article: REST API on Node.js and Express for data retrieved from Oracle Database with node-oracledb Database Driver running on Application Container Cloud. 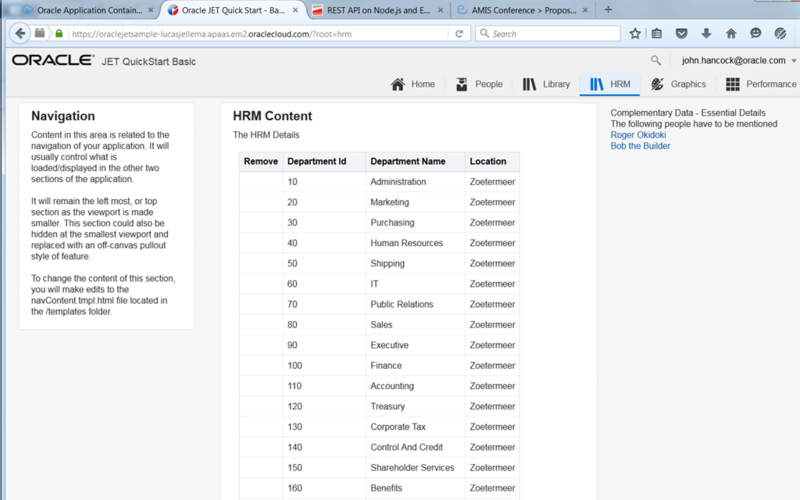 This Data API connects to a DBaaS instance and retries data from the DEPARTMENTS table in the HR schema. 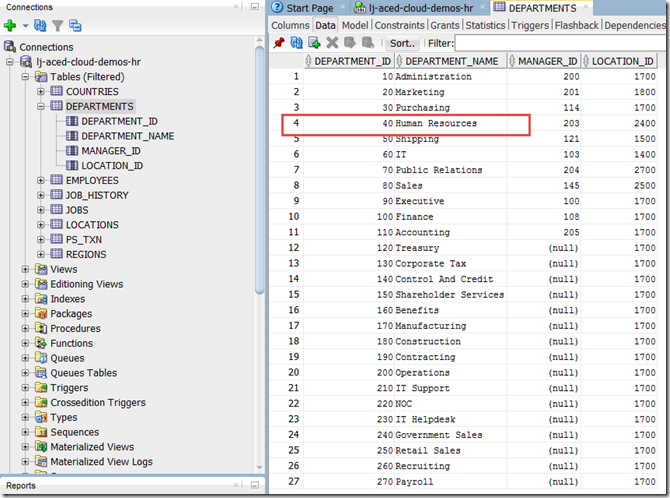 Extending the sample application with an additional tab that can be selected and shown, containing a table component with data binding to a newly defined viewmodel did not prove trivial at first. 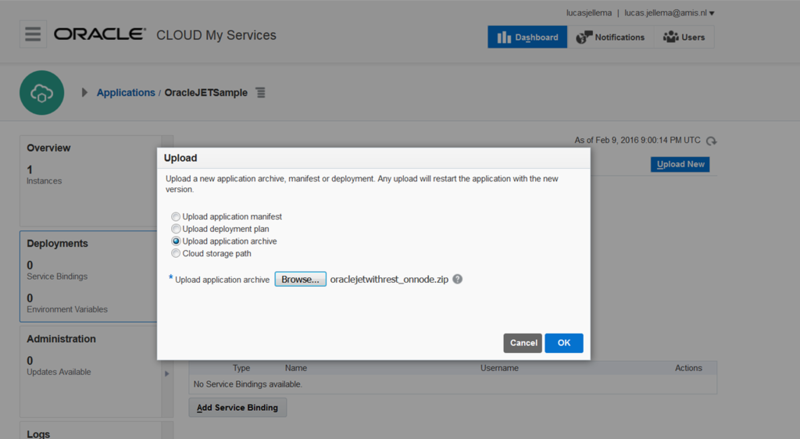 This was my first encounter with some of the frameworks included in JET – Require and especially Knock Out – and I ran into many small typos and fairly large misunderstandings. Now I believe I nailed it – and this article is the proof. I have listed the relevant files for this example. 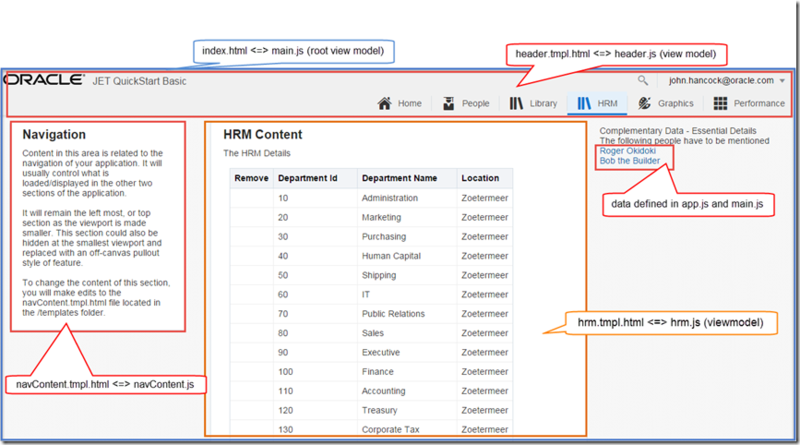 The Templates provide the UI content for specific areas in the main page that itself is defined through index.html in the root directory of the JET application (/public). In main.js – I have added the new module app to the list of required modules. Then I added app as an input parameter to the callback function. I have finally added a new instance of function departmentVM returned from module app to the rootViewModel, as property childvm. //bind your ViewModel for the content of the whole page body. The data binding for this anchor element is automatically in linked to the rootViewModel define in main.js. 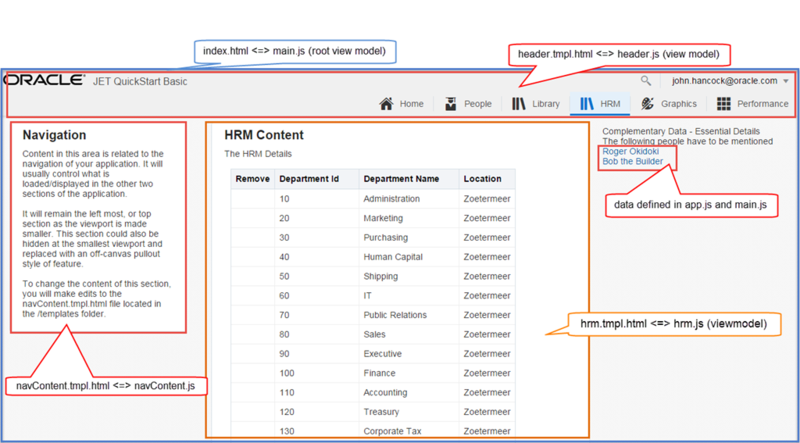 The binding childvm.personName refers to the childvm property in the rootViewModel that contains the departmentViewModel defined in app.js; this contains the personName property – whose value is initialized to Bob the Builder, the value we see in the screenshot. 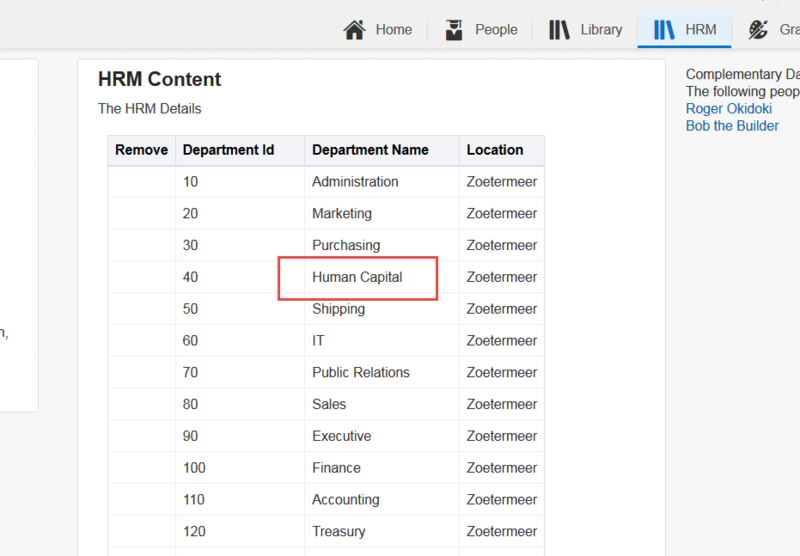 The table component is data bound to a collection that should be present in the current view model – the one returned from the hrm.js module. This collection model should be called datasource in the view model object and also should contain a set of elements (aka records). Each record should contain the properties used in the field definition in the elements in the columns array: DepartmentId, DepartmentName and Location. When we define the view model, we have to make sure of these property names. 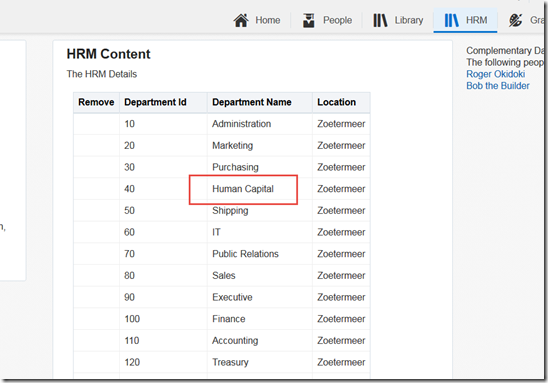 See how sorting is enabled on the columns Department Id and Department Name; this sorting is handled automatically and client side; note that sorting and paging are probably not a good combination. this CollectionTableDataSource can be created from an ojCollection , in this case held in DeptCol and based on DeptCollection. 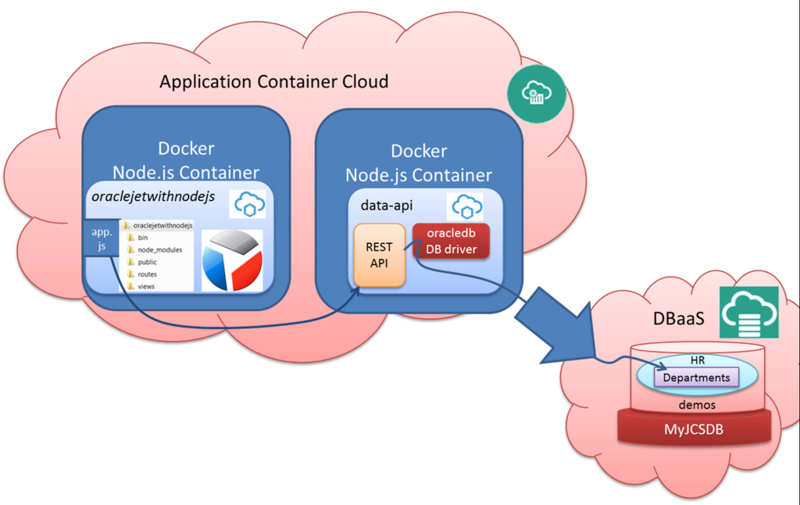 Running the application locally during development is very simple: using npm start – node.js is started to serve the application on localhost port 3000. Changes in source code are picked up immediately and passed on to the browser. 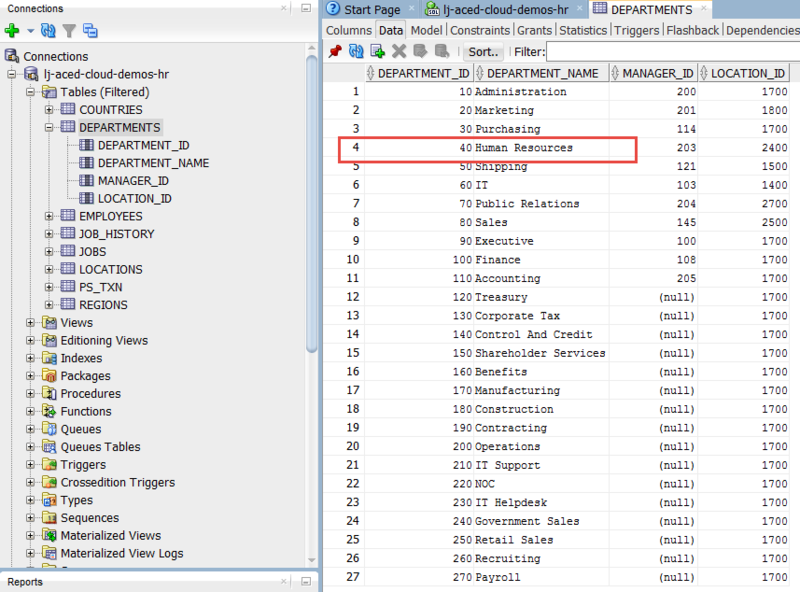 Creating a data bound table that fetches its data from a REST API turns out to be very hard at all. Running all-cloud applications – Front End Web application, REST API, DBaaS instance – and tying them together is not that difficult either. Once you know how to do it. 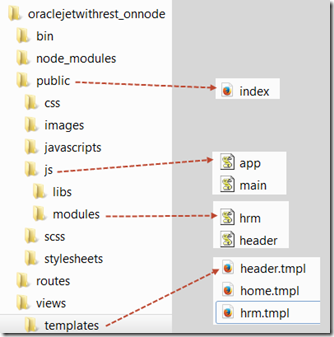 Download the Oracle JET application discussed in this article: oraclejetwithrest_onnode.zip . 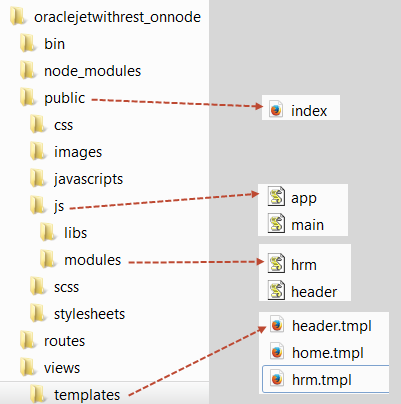 Note: the libraries shipped with Oracle JET (directory public\js\libs) were removed to reduce the size of the zip file.